The Irish Fair of Minnesota in Saint Paul from Irish Fair on Vimeo. The Irish Fair of Minnesota is a 501(c)(3) charitable nonprofit organization with 11 board members that are dedicated to supporting the Irish community in Minnesota. Each year, we invite you to join us on the banks for the Mississippi River for a celebration of Irish heritage with music, dance, family activities and good craic! 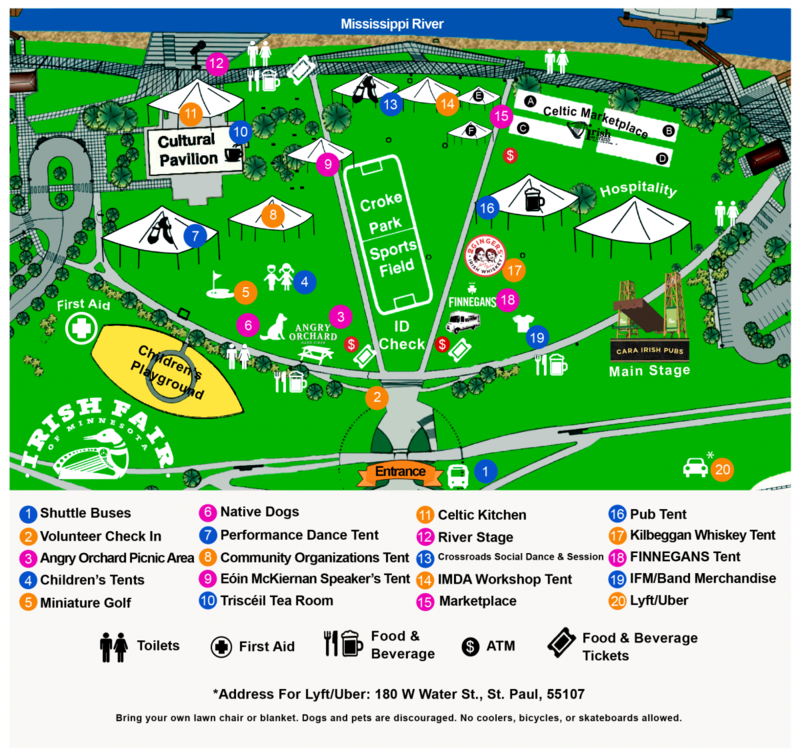 Since 2001, beautiful Harriet Island Regional Park in downtown St. Paul has hosted Irish Fair of Minnesota. The festival is recognized as one of the most family-friendly events in the Twin Cities, one of the most authentic Irish festivals nationwide and an amazingly great time by the 100,000 people who attended last year's festival. Come by, listen to the music, watch the dancers, and even enjoy a pint or two! All proceeds from the festival are reinvested Minnesota's Irish cultural community or shared with new immigrants groups through the Legacy Fund. The festival and organization is Volunteer driven and supported by people throughout the state. Please consider joining our volunteer team or donating to the Legacy Fund. To promote and cultivate Irish culture and preserve a rich heritage of traditions for future generations. The Irish Fair of Minnesota provides expression for all things Irish and links the past, present and future of Irish culture in Minnesota. Authentic. We believe the more Irish we are, the more universal our appeal becomes. Relevant. We strive to preserve a rich heritage of traditions that are relevant to today’s audiences. Fun. Creating a fun experience for volunteers and audiences alike is our top priority. Quality. Maintain a high standard in Fair programs and operations. Please consider supporting our long-range goals by contributing to the Legacy Fund.